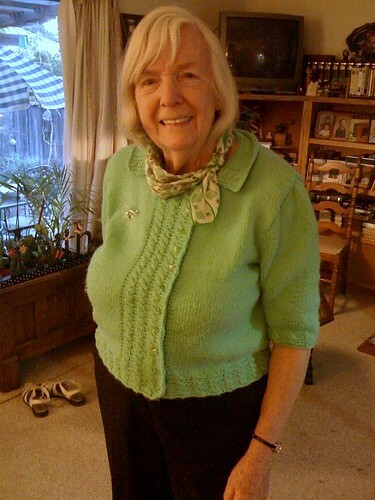 This is what Grams wore to the fish fry: a short-sleeved, green cardi with little cables at each edge. You can't really see in the photos, but she had used green, heart-shaped glass beads as buttons and they worked perfectly. 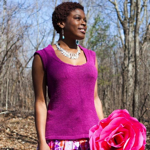 I think this is such a great, wearable springtime knit and the fun details make it something special. And I love, love, love how she's styled it with with the scarf and brooch. 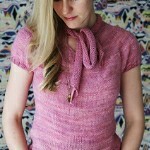 Here's a sweater Grams recently finished with a lightweight, wool/mohair (I think?) purple yarn. 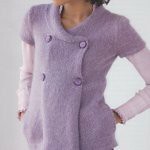 The entire sweater was knit in bamboo stitch, which created a fabric that was somehow cozy-looking and very light at the same time. Very cool. My favorite part is the ruffle. 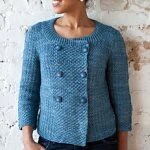 When she had finished the sweater, which was originally just a simple v-neck pullover, she thought it was missing something and could use a little oomph. So she adapted a scarf pattern she had just knit (ruffles cleverly made with short rows so as to avoid those bazillion-stitch rows!) to fit around the collar and fastened it with a long, sparkly pin. It completely changed the look of the sweater, and I think it's brilliant. Lastly, here is Grams' current work-in-progress, a short-sleeved, lacy, ribbed pullover made with some Kauni I gave her for Christmas last year (being half Danish, she needed some yarn from the motherland). The majority of this sweater was made with just one ball! I just love how the color changes are showcased in the circular yoke. 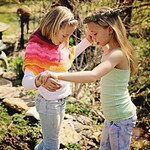 We had so much fun and we may have almost convinced my mom to pick up the knitting needles again. I hope we can do it again soon! 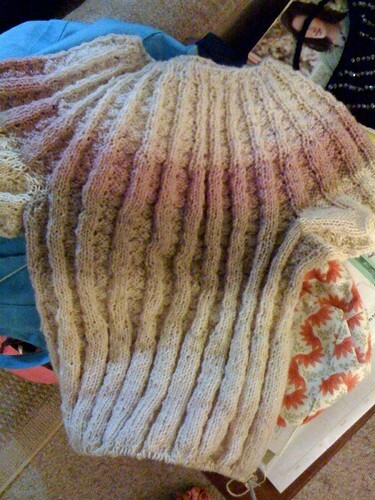 what a sweet post -- your grandmother's knitting is gorgeous! What a phenomenal trip you had. Your Grams has wonderful skills and amazing eye. That sounds like so much fun! Your grandma is super stylin'--I would wear those sweaters! Your Gram must have been so tickled and proud to model her handiwork for you. My grandma was a big tatter and while she wasn't at all boastful, she would get a little twinkle about her whenever I expressed interest in her doilies, dresser scarves, pillowcases, etc. She never thought it was special, but I knew different, and apparently so do you! 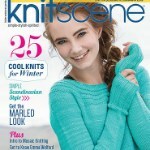 wow, amazing knitters run in the family!! She's quite the knitter, I love her current WIP. She seems like such a classy lady, and I can see where your eye for quality knitting comes from! 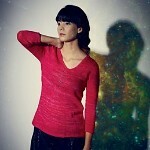 Did she put those sweaters on one after the other to model for you, photo shoot style? Wait, don't answer that. I'll cry. 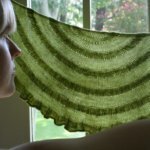 Awesome -- she's amazing - I love that you did a FO photoshoot! She's quite the sport, huh? Love this post, you're blessed with her! And it must be superbe for her to have such a granddaughter like you! It's so nice to share your obsession(s) with other people but I think its VERY nice when its family! How fun for both of you. I finally got my mom knitting more. She's getting over being such a chicken. It's touching... You have a wonderful grand-mother! Lucky you! Grams is awesome! Makes me miss my knitting grandmother - I didn't discover how wonderful knitting was until after she was gone. Thanks for sharing your stylish grandmother with us. I loved your post! Your grandmother is a star! One thing about knitting, for me, is that it's a hobby that I can share with my mom. The only one. Too bad my father won't join in! Have a great weekend! I wish I had half her style. You are lucky to have her. She is a doll. Your Grams is my ideal classy lady. 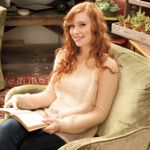 She looks terrific in her knits and really knows how to pull an outfit together. No surprise where you get your talents! 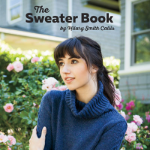 Maybe you could write up a pattern for that cute green cardi she's wearing. Hint hint. your gram is so cute, and the fish fry sounds so good! I love that she taught you to knit. SHe must be so proud of you! Once again, style runs in the family! What a great idea for a post. She is styling, isn't she! Do either of you ever knit things for each other? okay. first of all, i love your grammy! SHE is SO cute! and i can tell SO sweet. not to mention stylish AND talented!! i too love how she wore the broach and scarf with the green one. What a sweet and special thing to have... a grandma, and one that knits and is obviously fun. And very lady like. Love this post, Hil. Thanks so much for making it :) She is pretty awesome, isn't she? What I love about the photos of your Grams besides the obvious are her shoes. Both my husband and I, professional photogs noticed them before anything else. Whether you included them intentionally or not for me they make this environmental portrait of her wonderful! Don't worry about the quality of your camera it's your eye that matters. I love these portraits and her great style! You're a lucky woman to have her! 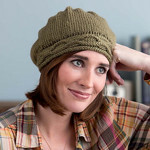 I just ordered the pattern for Lilas - and the yarn. Can't wait to get started. Thanks for this design. 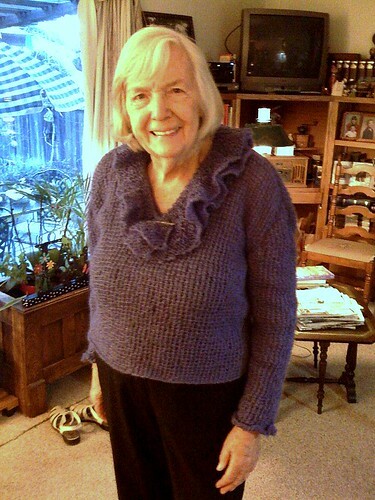 Oh yeah - my Mom is 95 and she knits every day. Isn't that cool.